PRESQUE ISLE, Maine — It’s the simple things in life that Bob Chavez dreams of for his family. He wants a home of his own, a place to store and arrange his things the way he wants and a gathering place for family and friends where he can barbecue steaks and serve corn on the cob. His dreams are in reach. Chavez, his partner, Jenny Charette, and her 7-year-old daughter, Natalie Charette, soon will move into a home of their own thanks to some help from students and instructors at Northern Maine Community College. The family is in line to receive the soon-to-be completed Sinawik No. 33 house. 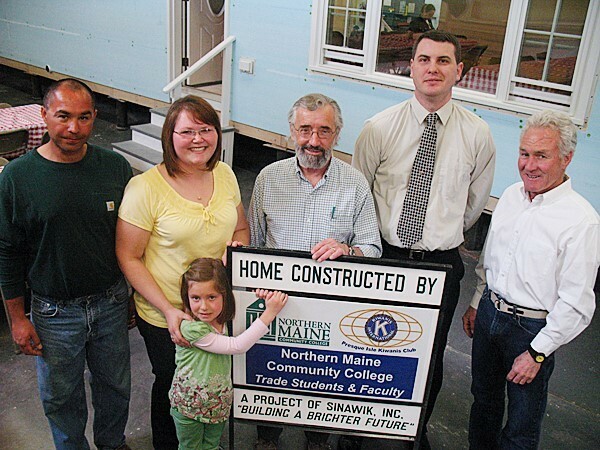 For more than three decades, Northern Maine Community College and Sinawik, a nonprofit organization founded by the Presque Isle Kiwanis Club, have worked each year to build a home that is contracted by and sold to an Aroostook County family. Chavez said he has never had a home of his own and dislikes apartment life. NMCC and Kiwanis formed Sinawik in 1976 to provide low-cost housing to qualified area homebuyers while giving NMCC trade and technical occupation students construction experience. On Tuesday afternoon, NMCC and Kiwanis Club held a community open house celebration and barbecue at the college to recognize the work of the students and the importance of the partnership between NMCC and Kiwanis. The building is a 1,300-square-foot modular ranch-style home. Though Chavez expects to be able to move in by June 1, the house now sits in two pieces inside the residential construction laboratory at NMCC. For six months, more than four dozen students and their instructors in five trade and technical occupations programs have had a unique learning experience by building the home. Preliminary floor plans are developed by the college’s computer-aided drafting program and approved by the customer. Once the plans are handed over, framing work on the walls, doors, windows and roof is completed by first-year students in the residential construction program. Students in the plumbing and heating program, the electrical construction and maintenance program and the welding and metal fabrication program do what is referred to as the “rough-in” work. With the plumbing and heating conduits installed, the wiring laid and ductwork in place, the structure is inspected. Then senior residential construction students do the finish work, which now is in its last stages and has included installing windows, doors and cabinets and completing interior trim. The Chavez home features two bedrooms, two full bathrooms, a kitchen and dining area and living room. Chavez said he will pour a foundation for the home in the coming weeks at his 297 Coffin Road property in Washburn. A few years ago, Chavez began pricing modular homes. Guy Jackson, NMCC’s residential construction instructor, has worked on 29 of the homes and shepherded the work of more than 350 students on the projects during his three decades at the college. He lauded the program and the experience it provides for NMCC students. A.J. Cloukey, president of the Kiwanis Club, said the club takes pride in working with NMCC on the Sinawik home project. Jenny Charette also has never had a home of her own. Chavez and Charette said the first thing they’ll do once they settle into their new home in early summer is have a barbecue. “We are very family-oriented, and I just want to have a barbecue at our new home and gather everyone together,” said Charette. “I want to do that too, have friends over and cook and eat outside and be able to sit out on my own lawn,” he said Tuesday. Robert Chavez and Jenny Charette, (from left,) along with daughter Natalie Charette, were on hand at the annual Sinawik Open House & Barbecue at Northern Maine Community College Tuesday afternoon to celebrate the near completion of their new home. The home is being built by students at the college through a partnership between NMCC and the Presque Isle Kiwanis Club. Also on hand to help celebrate the day were, continuing from left: Guy Jackson, NMCC residential construction instructor; A.J. Cloukey, president of the P.I. Kiwanis Club; and Jim Nesbitt, board member of Sinawik Corporation and project director for this year's home.